(Inside Science) -- Volcanos can sometimes spew a deadly onslaught of hot ash, lava, boulders and gas that gushes forth at up to 160 kilometers per hour. Now scientists have discovered these searing deluges -- known as pyroclastic flows -- reach such speeds by riding on a cushion of air that reduces friction, much like a puck does in a game of air hockey. Volcanic eruptions can generate pyroclastic flows when part of the eruption column collapses or lava domes crumble. The surging material rushes along the ground and destroys nearly everything in its path -- getting as hot as roughly 700 degrees Celsius. Pyroclastic flows cause more than half of volcanic fatalities globally. 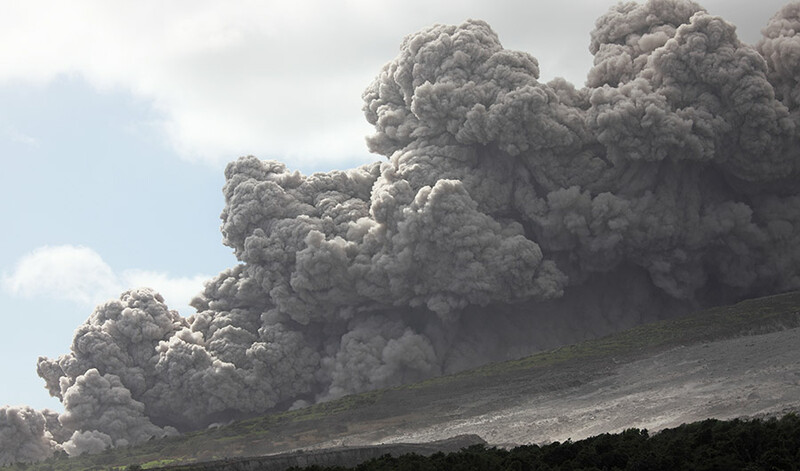 Although the flows can carry up to millions of tons of debris for hundreds of kilometers, volcanic material usually has such high friction "that it won't flow much at all," said volcanologist Gert Lube at Massey University in New Zealand. Attempts to figure out how real-world pyroclastic flows work failed because these volcanic floods destroy any equipment set up to analyze them. Instead, Lube and his colleagues set up mock pyroclastic flows, each of which involved releasing up to 1,300 kilograms of volcanic ash gathered from the Taupo Volcano, which erupted in New Zealand in 233 A.D. They heated this ash up to 130 C and then dropped it down a 12-meter slope equipped with pressure sensors and monitored it with high-speed video cameras. The scientists found that when volcanic material slides downward quickly, the gases within the base of such floods get forced toward the ground. The resulting air cushion dramatically reduces the amount of friction pyroclastic flows experience. "This enigma has been around for more than 50 years now, and solving it means that we can now tailor hazard models to forecast hazards accurately," Lube said. This could help save millions of people at risk of pyroclastic flows worldwide, he added. The scientists detailed their findings online April 8 in the journal Nature Geoscience.